Synthetic peptide within Human VEGF Receptor 1 aa 1300 to the C-terminus (C terminal). The exact sequence is proprietary. VEGFR 1 is a cell membrane receptor kinase. It has a high affinity receptor for vascular endothelial growth factor and is putatively involved in the growth of endothelial cells and angiogenesis. Our Abpromise guarantee covers the use of ab2350 in the following tested applications. 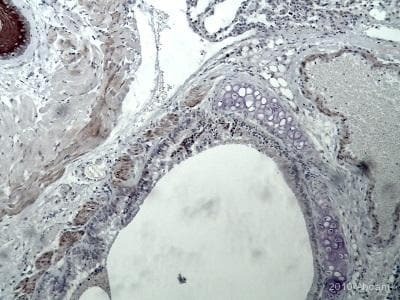 ab2350 staining the VEGF Receptor 1 in Mouse lung tissue sections by Immunohistochemistry (IHC-P - formaldehyde-fixed, paraffin-embedded sections). Tissue was fixed with formaldehyde and blocked with 10% serum for 1 hour at room temperature; antigen retrieval was by heat mediation in citrate buffer (pH 6). Samples were incubated with primary antibody (1/100) for 16 hours at 4°C. An undiluted biotin-conjugated Goat anti-rabbit IgG polyclonal was used as the secondary antibody. ICC/IF image of ab2350 stained A431 (human epidermoid carcinoma cell line) cells. The cells were 100% methanol fixed (5 min) and then incubated in 1%BSA / 10% normal goat serum / 0.3M glycine in 0.1% PBS-Tween for 1h to permeabilise the cells and block non-specific protein-protein interactions. The cells were then incubated with the antibody (ab2350, 5µg/ml) overnight at +4°C. The secondary antibody (green) was ab96899, DyLight® 488 goat anti-rabbit IgG (H+L) used at a 1/250 dilution for 1h. Alexa Fluor® 594 WGA was used to label plasma membranes (red) at a 1/200 dilution for 1h. DAPI was used to stain the cell nuclei (blue) at a concentration of 1.43µM. Formalin fixed paraffin embedded human angiosarcoma stained with VEGF Receptor 1, using ABC and AEC chromogen. Publishing research using ab2350? Please let us know so that we can cite the reference in this datasheet. Could you please tell me if this antibody has already been tested on canine tissue? Thank you for your e-mail. Amplification is a method to amplify signal on immunohistochemical preparations where there is low abundance of the protein of interest (or the primary antibody binding affinity for the protein is low). The most common amplification method is the ABC method, where this procedure employs biotinylated antibody and a preformed Avidin: Biotinylated enzyme Complex and has been termed the “ABC” technique. Because avidin has such an extraordinarily high affinity for biotin (over one million times higher than antibody for most antigens), the binding of avidin to biotin is essentially irreversible. In addition, avidin has four binding sites for biotin, and most proteins including enzymes can be conjugated with several molecules of biotin. The high sensitivity reported for this technique likely resides in either the form or the number of active enzyme molecules associated with the complex and the rapid, irreversible interaction of the complex with biotinylated antibody. 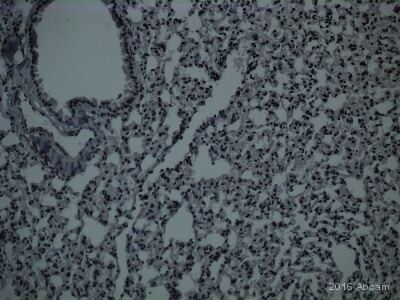 In addition to high sensitivity, ABC kits produce very low background staining. In summary, following incubation of the primary antibody (rabbit), wash in PBS your sections/cells, then add an anti-rabbit secondary antibody which is biotin conjugated, incubate for 2-3 hours, then wash in PBS and add HRP-conjugated avidin (provided in a kit, such as the Vector ABC kit). The avidin will bind to the biotin with high affinity and provide an amplification. When DAB will be added at the last step the numerous HRP proteins will give more signal and you will be able to visualise the localisation of your protein of interest. I have just purchased your product ab2350 (VEGF Receptor 1 antibody)and there is no indication about dilution for western blot in its data sheet. Which starting dilution do you suggest? I would recommend a preliminary experiment using a range of dilutions: 1:200, 1:500, 1:1000, 1:3000 for example and optimise the dilution following the outcome of this experiment. We received an inquiry from one of our customer about your product of #AB2350. Could you please let us know whether #AB2350 recognize Phospho-VEGF Receptor 1,or not ? We look forward to receiving your early reply. What is the peptide sequence against which this antibody is raised? I would be interested to do a blast search for that sequence to see if it shows any degree of homolgy to sheep VEGF receptor.